Remove self-doubt by addressing these four areas: Remember to reframe confidence. Be MORE intentional about who you want to be (everyday). Get clarity, get a plan, get momentum. Adopt a learning perspective vs. a judgmental perspective. This is a MUST WATCH episode about dealing with self-doubt (and how to discover the strength that already lives inside of you). Make sure to complete this episode’s worksheet here to gain more clarity and momentum! We all deal with self-doubt. It’s not something that’s ever actually going to go away, so you’ve got to figure out how you are going to reframe it. 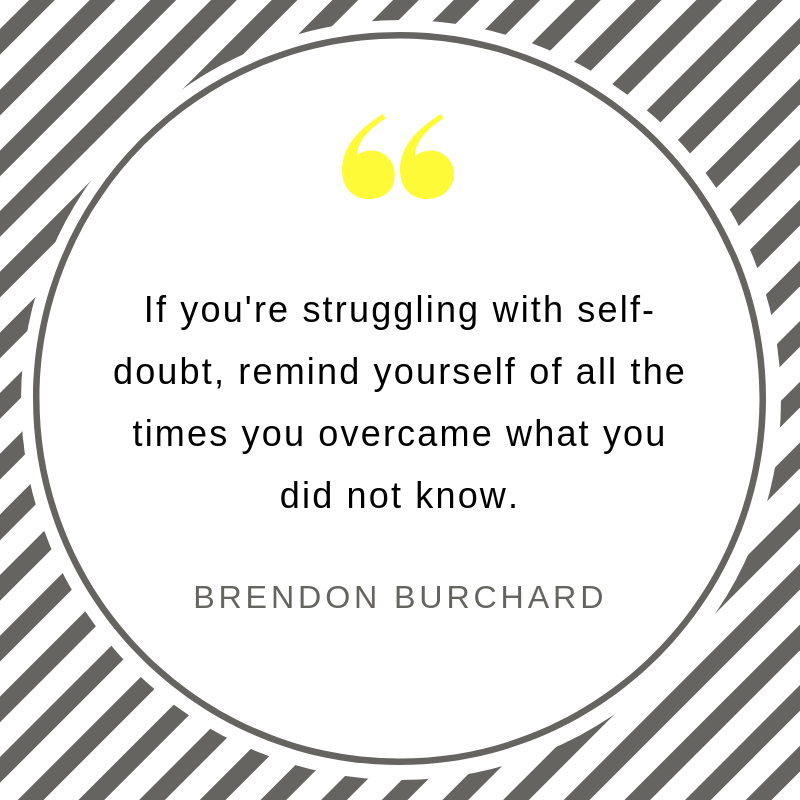 How are you going to use self-doubt as a tool to motivate you, to make you stay driven, to make sure that, even in those things you’re scared of, you approach them with courage? Self-doubt isn’t something you should be upset that you have. I go onto arenas where there’s 25,000 people in the audience, and I’m backstage, and I have that anxiety, I have that concern. I have the doubt of, ‘Am I going to do a good job today?’ And I worry about it, too. Everybody has self-doubt. The challenge is, some people think they don’t need to ever have it, and some people are using it as a tool to stop moving towards their dreams, instead of progressing towards their dreams. So here’s four big ideas on how to better deal with self-doubt, so that you can still go after your dreams. You have to reframe confidence. 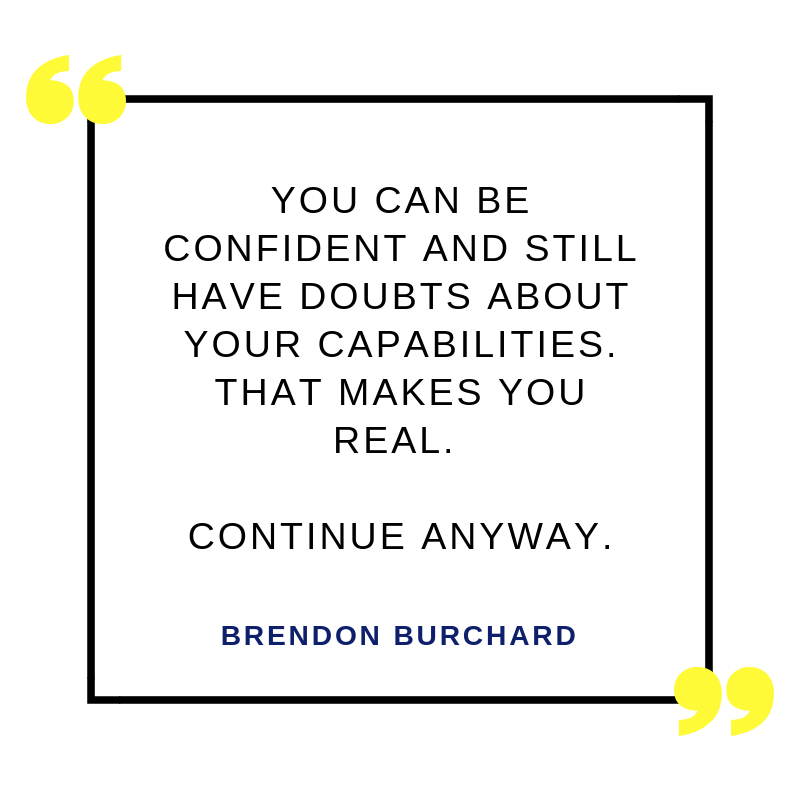 A lot of people say, “Brendon, I’m just not confident. I wish I was more confident, I wish I had more fire, I wish I believed in myself more. I always worry about myself, I never believe in myself, I’m always selling myself short, and I never give myself credit. I just quit.” I think what happens for a lot of people is they just never really learned what real confidence is. Sometimes the truth is that you can be confident, but still have doubts about capabilities- and that makes you real. It makes you a non-egomaniac, because only super egomaniacs completely lack self-doubt. And so self-doubt can be okay. What you have to figure out is, what does confidence mean to you? Instead of worrying so much about the doubt, what’s the opposite? What’s the other part of that? What does confidence really mean to you? We did the largest study that’s ever been done on high performers, worldwide, and what we learned is, the most successful people in the world approach confidence in this way: they believe in their ability to figure things out. It doesn’t mean they don’t have self-doubt; they just believe, “I can figure things out. Give me enough time, energy, resources, mentorship, support, and I can figure anything out.” You have to start believing that. As much as you spend time questioning yourself, you have to think, “Can I remember that I figured out things in the past that I wasn’t prepared for?” You’ve done projects in the past, you’ve been in situations in the past where you had no idea how to handle it, but you figured it out. Take confidence in that. The next time you’re going into a situation, and all you can do is think about yourself freak out, what I want you to do is to remember all of those times where you did overcome the doubts, you did overcome the anxiety, you overcame the lack of skills, the unknowns, and you still pulled it off. There are more times in your life that you overcame self-doubt, than you give yourself credit for. Maybe you showed up that one time to school, and you were self-doubting, but people liked you, and you were just fine. Maybe that one time you went into that project, and you knew you didn’t know how to do it, but by the end of that week, or the end of that month, you figured it out. 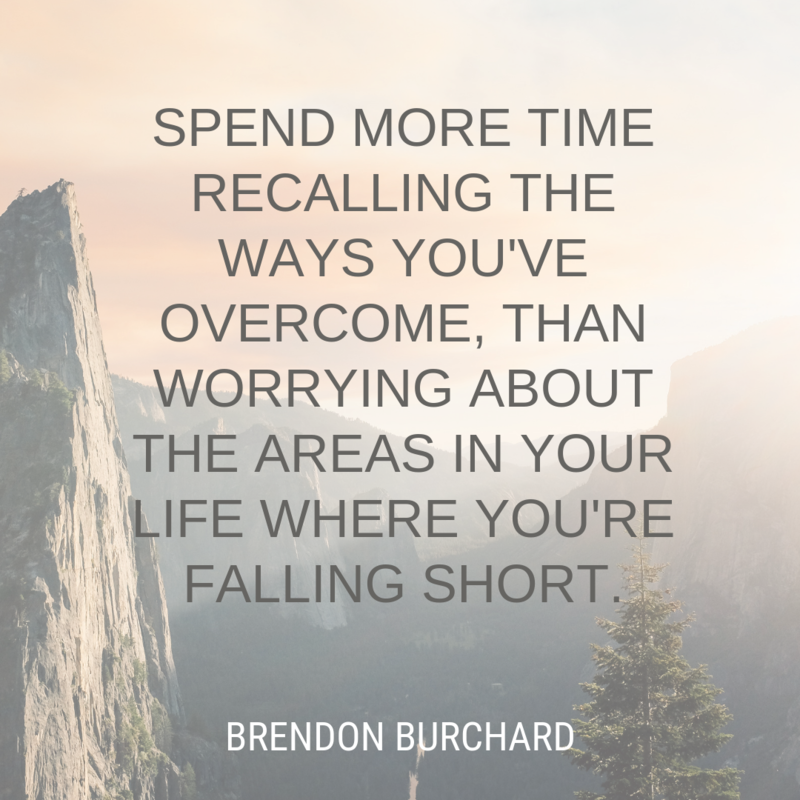 You have to have a memory for the things that you did overcome, as much as you worry about the things that you’re lacking in. If your thought pattern is always repeating, “I lack, I lack, I lack, I lack, I lack…” of course you’re going to self-doubt all the time, to a degree where you stop trying. If you can have that positive self-talk, and remind yourself of all the times you overcame what you did not know, that will lead to a genuine self-confidence. You might find yourself saying: “You know what? I believe in my ability to figure things out. Even if I have some doubts about how it might go, or doubts about how things might turn out, I do know that I will figure it out. Give me enough time, energy, effort, resources, and support, and I can do it.” Like I said, that’s genuine self-confidence. Even though you have doubts, the next time you’re going into that situation where you have doubt, I want you to say, “You know what? I’ll figure it out,” and trust in that. #2: Show up with intention. If you want to deal with self-doubt, you absolutely must start entering each day with more intention. One of the reasons we doubt ourselves is because we’re just all over the place. Sometimes you’re cool in this situation, but you’re dumb in that situation. Sometimes you don’t do well here, but you do well there. What happens is, so many people are going through the motions, or they’re just showing up in life every single day, and they’re reacting, and because they’re always reacting, they don’t have a character. They haven’t determined: Who am I, really? Who am I going to act like in this situation? Who am I going to behave like in this situation? How am I going to treat people in this situation? Because they haven’t shown up with intention, and sought to live out that intention, they feel a lot of discord in life. They don’t know who they are, because they just keep showing up, and reacting to what’s there. But guess what? What’s there is always different. The world is always changing, people are always changing, and situations are always changing. If all you’re ever doing is showing up and reacting, thinking, “I guess I’ll just go through it and see how it goes”, you’re never forming an intentional character. Of course you doubt yourself, because every situation is different, and you can never have certainty in that. But you can have strength inside. From now on, wake up every day, and you say, “I’m going to be these three words, today.” And you just set the words, you say, “I’m going to be fun, I’m going to be playful, I’m going to be kind.” And that day, you are fun, playful, and kind. And the next day you say, “I’m going to be patient, thoughtful, and appreciative,” and you act patient, thoughtful, and appreciative. You do that over, and over, and over again, set an intention for who you want to be, and be that. Set an intention, and be that. Do that in more situations in your life, and more days, weeks, months, and years, and you’ll be confident in yourself, because you know that you can direct your mind, and your emotions, and your body, to be the person you really want to be. The more often you do that, the more real, genuine, self-confidence will come into your life. #3: Get clarity, get a plan, get momentum. You need to get clarity, you need to get a plan, and you need to get momentum. What I mean by that is, a lot of people have self-doubt in their lives because they don’t have clarity for what they want. A lot of people wander into a situation, and they have a lot of self-doubt, because they didn’t sit down and plan it out. They didn’t prepare. They didn’t ask mentors, or model others, or do the research to figure out, “I should do a, b, c, d, and e.” In other words, if you don’t know the steps to success, of course you’ll have more self-doubt. If you don’t have the plan, if you don’t have the map, if you don’t know what you’re doing, of course you’re going to have more self-doubt. Decide to build a plan, even if you have to ask for help. Ask, “Hey, guys, how would you do this? What would be your first step? What would be your second step?” I’m always asking that. Even at this stage in my career, I’m still saying, “Hey guys, if you were going to launch this, how would you do it? If you were going to promote that, how would you do it? If you were going to create this thing, how would you do it? If you were going to build this team, or build that business, what would you do?” I always try to get the map before I enter the woods, so that I have the steps. I know the path, because if you can remove the doubt about the path, you’ll have more confidence in yourself. The fourth big idea for you (this one is so straightforward, but I think people don’t do it), is that you need to learn versus judge, when it comes to your behaviors and your results in life. Start a Sunday review, and every Sunday all I want you to do is sit down, and really evaluate how you showed up this last week. How did you really show up, Monday, Tuesday, Wednesday, Thursday, and Friday? Start experimenting with how you view yourself by doing a better job of reviewing your week. I think one reason people don’t have as confident a mentality as they should, is because they’re just barreling through oblivious to how much they’ve grown. Instead of judging yourself, every week you can have a real self-evaluation session: How did I do, what did I learn? In that personal development, can you look at yourself objectively, without judging, without being mad, without giving it negative labels, and just ask, “How did I do? What did I learn, what could I have done better?” Observe how you’re going through your life, and then tell yourself, “Next time, I’ll do this differently, and next time, I’ll do this, and next time, I’ll do that.” That’s a learning mentality versus a judgment mentality. A judgment mentality is: I was an idiot. I was stupid. I didn’t like myself. I look stupid. People are going to make fun of me, they’re going to hate me. That judgment self-talk leads to low self-confidence. Most people spend most of their time criticizing themselves. Their self-talk is negative, instead of learning-oriented. 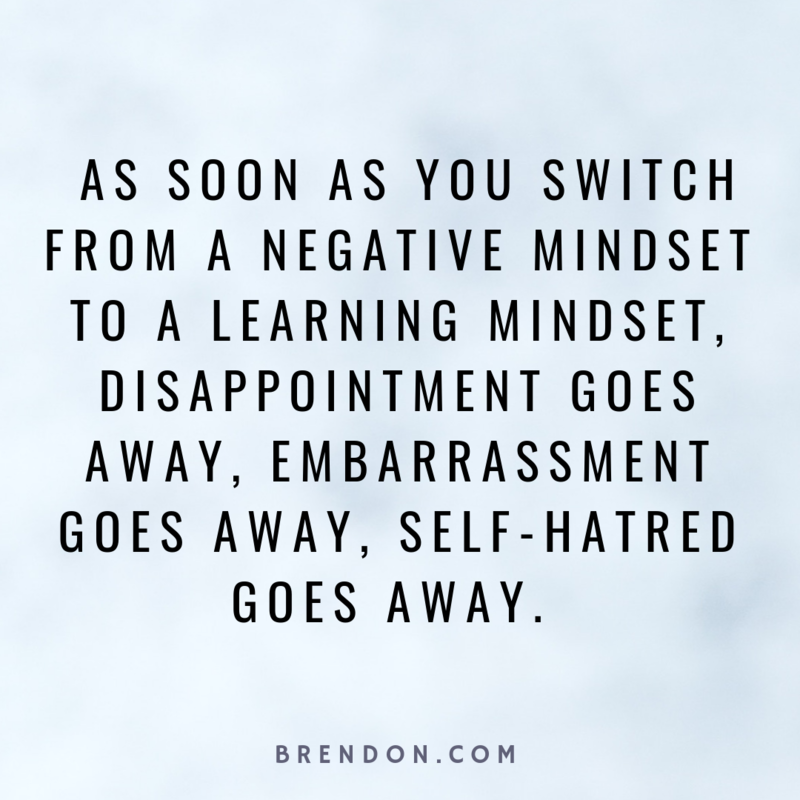 As soon as you switch from a negative standpoint to a learning standpoint, disappointment goes away, embarrassment goes away, self-hatred goes away, and you start just learning your way into the new, and strongest, you. Make sure that you start each day, or walk into each situation, with a little more intention. Who do you want to be? And live into that, more consistently, because that will start to form your character that you can take confidence in. Make sure you get the plan, you just take those steps, you get a little momentum, because with momentum comes more confidence, and a little more self-assuredness. Make sure you are learning. Keep learning from me, keep learning from other people. Watch my other videos, listen to my podcast, read my books, listen to other people’s podcasts, and books. Get yourself in the game of personal development, and into a perspective where you’re learning about yourself, and you’re proud of yourself for that growth. Do you know when you’re going to be the most proud of yourself? When you find real, genuine self-confidence, and when you are growing at the rate, and the speed, that you truly desire. So keep learning, my friend, because listen: you’re stronger than you think, and the future holds good things for you.